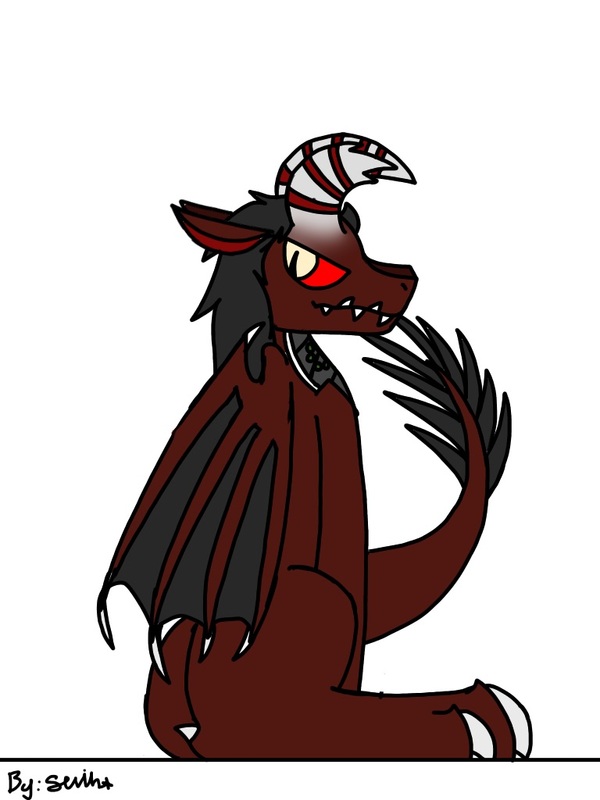 Type: In all honesty, they could be anything with his maliable form, bit they likes to be a Western dragon most/all of the time. Personality: Karma acts as if others are pawns of something greater, yet also shows compassion for those in which he enjoys, relates to, or simply when he deems it appropriate. They tend to be a bit secluded from others, and rather brash and straight forward in times of peril and grief. Karma also gets frustrated when others act in ways they don't like, or does thinga that he finds stupid. Overall, they can be boring and friendly, and secluded when the times come for them. Hobbies: Wander and waste their life away watching others. Likes: Studyimg culture, governments, and overal hierachy. Dislikes: Ignorance, belittlement, and pretty much anything that goes against their belifs. Fears: What would happen if a ruthless dictator managed to rule the entirety of Nuira, and it isn't as much of a fear as it is an inconvenience, but those that are stronger then they are. Place of Origin: High in the mountains. Tribe: They are a rogue. Language: A little bit of everything with the years they have studided the tribes. Home: Wherever they can find. Siblings: Two, a brother and a sister. Height: Average height of Karma is 22 feet, though he can make himself grow to the size of an average adult. Scale/Fur/Feathers: Karma's scales are made entirely of blood, so it would only be appropriate from them to be smooth and red. Eyes: Karma's eyes don't have a set color, but they prefer to have their eyes red, and thier pupils a tanish white. Accessories: Karma wears several rings, one of which are made from pure gold with an emerald embedded into it, and a Tungsten ring with a Ruby embedded into it. They have two more silver rings with no gems in them. They also wear one earring that looked like a golden feather on their left ear. They have a necklace that looked like it had a weird golden cresent moon scepter with a sapphire in the center of the moon. Karma also has five red rings around their left horn, but only three on the left one. Armor: Not very often. But they do have a set of very special armor hidden away somewhere. Horns/Spikes: Curved forward and white. The tip of the right horn is broken. Abilities: Depending on their environment, Karma can possess several abilities from their ability to hypnotise others if melded with the hallucinagetic natire of rainforests, all the way to created weapons out of the iron in their blood if they melds with mountainous regions. They will have these individual abilities until they meld with another environment. They can also harden the smooth and vunerable blood scales into armored plates for a period of time to give them an increased resistance to physical attacks if they so please. Strengths: Karma has trained themself to resist most forms of psychological warfare, but their physical strengths don't adhere to it. Weaknesses: Karma is vunerable while their smooth blood scales cover his body instead of his armored plates. Using their plates causes them to grow fatigued the longer they use them. Fighting Style: Karma is a jack of all trades, but prefers to use magic and look his opponent in their eyes when he fights. But if they know they cannot win like that, or are outnummbered, they will resort to ranged and aerial attacks. Fears: What would happen if a ruthless dictator managed to rule the entirety of Nuira, and it isn't as much of a fear as it is an inconvenience, but those that are stronger then they are. The second half of your first fear doesn't seem to make sense. Add one more fear. (2 in total). Place of Origin: High in the mountains. What continent? Layrian? Verula? Shveki? Language: A little bit of everything with the years they have studided the tribes. Are they fluent with in all languages? Or do they struggle with them all entirely? Height: Average height of Karma is 22 feet, though he can make himself grow to the size of an average adult. Height needs specification. Wingspan: 14 feet Dragon's wings are much, much larger in order to fly, unless this was intentional? Scale/Fur/Feathers: Karma's scales are made entirely of blood, so it would only be appropriate from them to be smooth and red. Could you explain how they're made of blood? Armor: Not very often. But they do have a set of very special armor hidden away somewhere. Why is it so special? Could you elaborate? Please credit who made this artwork in a link. Abilities: Depending on their environment, Karma can possess several abilities from their ability to hypnotise others if melded with the hallucinagetic natire of rainforests, all the way to created weapons out of the iron in their blood if they melds with mountainous regions. They will have these individual abilities until they meld with another environment. They can also harden the smooth and vunerable blood scales into armored plates for a period of time to give them an increased resistance to physical attacks if they so please. As it comes from magic, this should be with/under Environmental Melding. Also, make sure you list every ability and function and describe how they work, melding in mountains, forests, etc. What is their range, if any? Weaknesses? Cooldowns (in posts), and time they can keep these forms held? (in posts) Are there limits? Weaknesses: Karma is vunerable while their smooth blood scales cover his body instead of his armored plates. Using their plates causes them to grow fatigued the longer they use them. This last sentence should be a part of his armored plates, since this isn't a general weakness. Be sure you have at least 1 more weakness than there are Strengths. Magic: Environment Melding(Read special abilities) Bring the respective abilities down here please. Okay. I am going to respond to a few things and I will refer to Karma as a he from here. 1. There is no second part to his first fear, they are two separate fears in one sentence. 2.I cannot credit the artist with a link because I did not ask them to make it from a site like patreon and such. It was in a private discord chat, and I asked if they could make my character and they did it. 3. I don't see why placing the weakness of my special ability in the correct category is wrong. 1. So they fear the world being taken over, and dragons larger than them? Then that's fine. The gender-neutral pronoun might've gotten me mixed up, as with how it was worded. Sorry about that. 2. If it was made for you by request, then you should be fine. The armored scales are a downside to having it active when they use that power in particular. It should be listed with that ability as a downside. Weaknesses in general are things such as being physically or mentally weaker than others, susceptible to disease or simply flaws. You can look at other character sheets for examples if you ever have trouble. 4. While I understand this will be a lot to go into detail on, but it is necessary, would you be able to at least give a summary of it? We don't require a full on essay of how it works, but we don't like powers being vague either. We need to know the limits of them. You also need to explicitly describe what your shape shifting is.